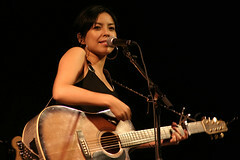 Canadian singer-songwriter, Emm Gryner. This is a name you should try to remember. This entry was posted in Canadian Music, Singer Songwriter and tagged Canada, Emm Gryner, Music, Singer-songwriter. Bookmark the permalink. Nice pick! I’ll be going through the rest of her youtube catalog. Unfortunately there isn’t much there.